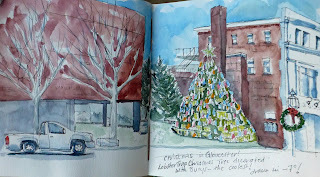 We were lucky enough to spend time with family on Cape Ann and came upon this cool Christmas tree. Made from lobster traps and decorated with buoys. The best! Wish everyone a super start in the new year with many great sketches! Hi Maria, what a surprising convincing water colour of an unbelievable Christmas tree within the surroundings of Gloucester.Happy New Year!